Ticker is the only system capable of emitting any type of programmed ticket (for bus, tram, or any other means or available service) on different media. It is possible to print tickets on standard 80 g thermal paper or on cardboard up to 220 gr. Ticker can be integrated with any other automation system already in place, with parking barrier systems or other pay parking systems. Ticker can be used for any type of payment provided by the system operator (fines, minutes, permits, etc. ), with summary reports, local or remotely, of each movement made. The 12-key alphanumeric keyboard installed on the Ticker – similar to the daily use of our mobile phones – allows the user to make payments quickly and easily. Apart from all what is found in normal parking machine(coin reader and escrow), Ticker S has qualities thatt make it unique thanks to its six-channel change dispenser, an highly visible 5.7” graphic display, complete MP3 voice synthesizer, stainless steel 304/316/430 vanda-proof keyboard, reprogrammable locks for management access. Ticker S range can be enlarged by further functions: bills reader, wireless or contact electronic card reader, credit card reader, NFC reader, barcode reader for various services payment or interfacing with other OFF STREER parking system with barriers, integrated solar panel, quad band modem, second printer for differentiated ticket emission, 39-key keyboard for payment of fines or limited traffic zone access permits. Ticker S can be customized with colors and images for specific communication needs. Ticker S software allows the system manager immediate and simple remote control and management using any of the currently available communication networks: GSM, GRPS, UMTS, Bluetooth, etc. When there is a malfunction or breakdown, the management software sends an alarm message so that the mantainance staff can intervene in a rapid and targeted way. Ticker S adopts a variety of bar code applications it can interface with any other automation system, for example, using the same ticket for on-street parking lots with exit barriers. 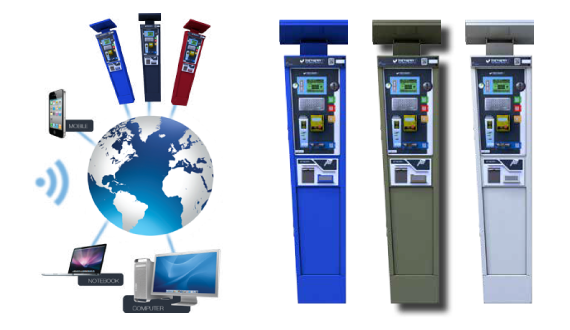 The full version of the Ticker parking meter includes a 17 “LCD monitor with anti-reflection screen on which you can transmit AVI video, thanks to a PC inside the emitter that can be activated from local or remote. In this way the system operator can offer the most varied information content (museums, parking lots, pharmacies on duty, advertising, etc. ..) to a large number of contacts at no cost.